Are you struggling for storage space with your feed? If you're having problems with your current feed store then we recommend the unique Bulk Bin Feeding System from Chestnut Horse Feeds. I am delighted with Chestnut Horse Feeds, the delivery system is easy and they have a great range to suit all horses. Our bulk bins are delivered direct from our mill filled with the chestnut Horse Feed of your choice. When you are running low simply place your next order and we will replace the empty bin with a full one. The bulk bins are supplied on free loan for the life of the feed. How do I use my bin? The bulk bins can be stored anywhere either inside or outside, out of direct sunlight. They are supplied on wheels and can be moved around your yard easily. Our customers have found it a very convenient and hassle free way of ordering and storing their feed. 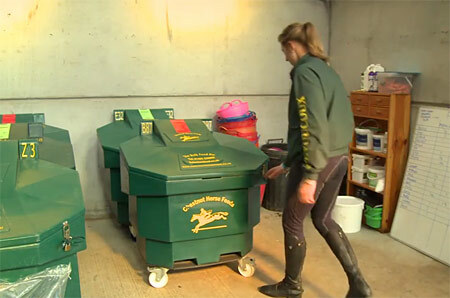 The Chestnut Horse Feeds bulk bin holds up to 190kg of feed, dependant on the product chosen. 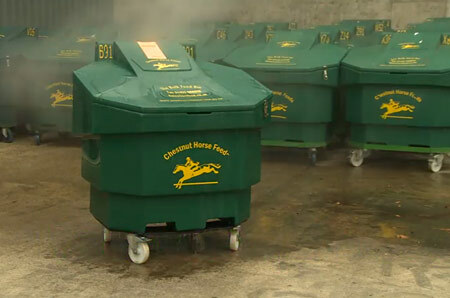 All Chestnut Horse Feeds are available for delivery in our unique bin system.